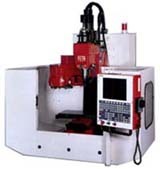 Dyna DM 1007 asztali CNC megmunkálógép - CNC gép, kábelvédő, fúrótömlő; Kutenich Kft. The smallest Dyna machining center is constructed from FC30 cast iron with precision grounded axes ways, which provide better stability and exceptional accuracy. With its standard rigid tapping function, The DM 1007 can double the tapping time and reduce the tooling cost, compared to a conventional floating tap holder.